Sweet and Sour Ground Pork Meatballs are a fun and budget-friendly way to enjoy Asian flavors in a ground pork recipe! 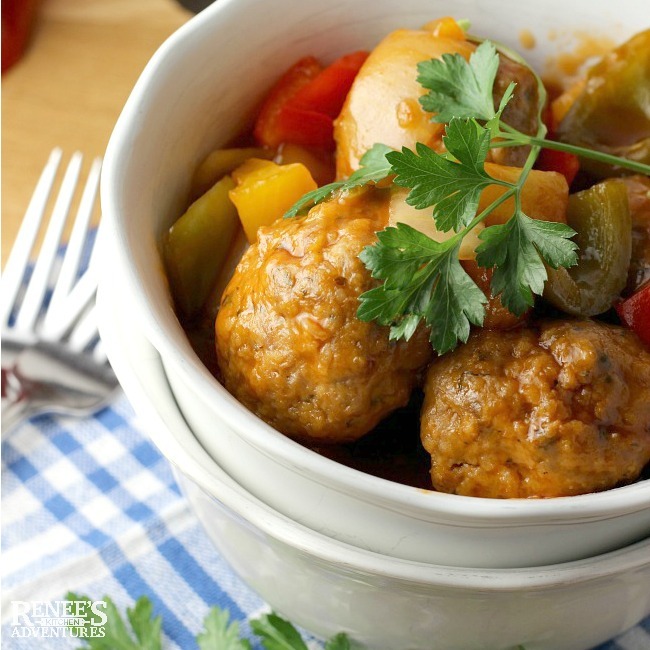 Tender ground pork meatballs are flavored with garlic and ginger, then baked before heading into the slow cooker with veggies, pineapple and a delightful homemade sweet and sour sauce! Serve these ground pork meatballs with rice or over pasta (like I did) for a complete meal. With 19 grams per serving, ground pork is a great economical protein for your family! Ground pork also makes the most flavorful and tender meatballs ever! 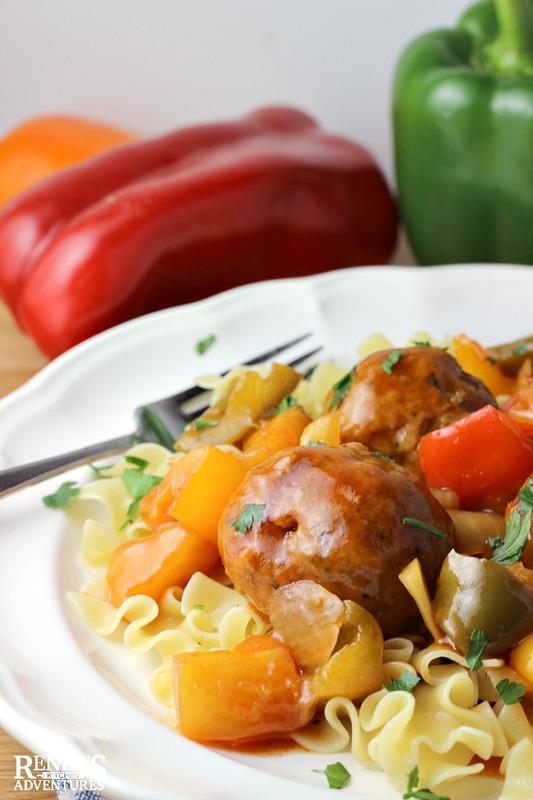 We are in love with ground pork meatballs! When the Ohio Pork Council asked me to create a recipe using ground pork, my mind immediately went to ground pork meatballs. And when I thought about how to elevate those ground pork meatballs to a new flavor level, using them as the pork component in my favorite sweet and sour pork recipe seemed like a winner. My family enjoyed these Sweet and Sour Ground Pork Meatballs so much, they'll be making frequent appearances on the family menu! 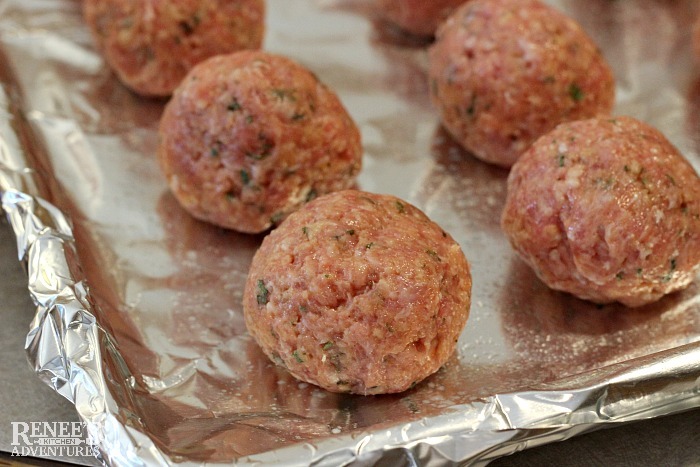 The ground pork meatballs come together quickly and are oven-baked to help them hold their shape. I use a small ice cream scoop when I make meatballs to help with the portion size. If you wanted to make this ground pork recipe ahead, you can prepare the ground pork meatballs and bake them, then cool and freeze. Once the ground pork meatballs are baked, they are added to the slow cooker with onions, peppers, frozen pineapple and my favorite homemade sweet and sour sauce. Set the slow cooker to HIGH and let everything cook for about 2-3 hours (until the veggies are soft). If you are starting off with frozen pre-baked ground pork meatballs, add another hour or two onto the cook time in the slow cooker. Once done, serve the ground pork meatballs over rice or pasta for a complete meal. 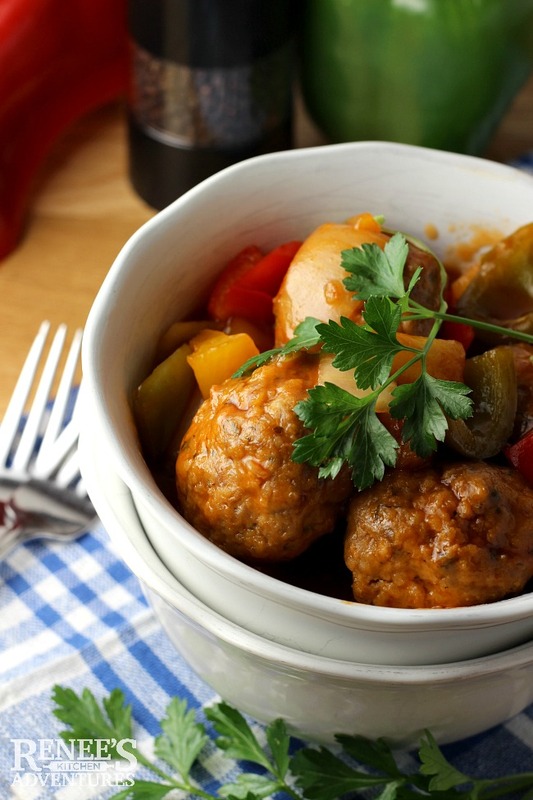 Sweet and Sour Ground Pork Meatballs are something a little different for your weeknight dinner table. When it comes to ground pork recipes, these ground pork meatballs are at the top of my Yum List! They would also be great served as an appetizer on a buffet! Hungry for more? Click here for more great pork recipes! Read about life on an Ohio Hog Farm here! Preheat oven to 425 degrees F*. Line baking sheet with foil and spray lightly with cooking spray. In large bowl, mix ingredients for meatballs until well combined. Form into 2" balls and place on baking sheet. Bake in oven for 10 - 15 minutes. (meatballs DO NOT have to be cooked through. They will finish cooking in the slow cooker!) While the meatballs are baking, make the sauce. In medium bowl or large glass measure, combine all ingredients for sauce except peppers, onions, and pineapple. Whisk to combine. Add peppers, sweet onion, and pineapple to crock of slow cooker. Top with baked meatballs. Pour sauce over all and cook on HIGH for 2 - 3 hours, or until vegetables are tender. *NOTE: 425 degrees F was fine for my oven, but some ovens run hot. Adjust the temperature down by 25 degrees or so if you know you oven runs hot. 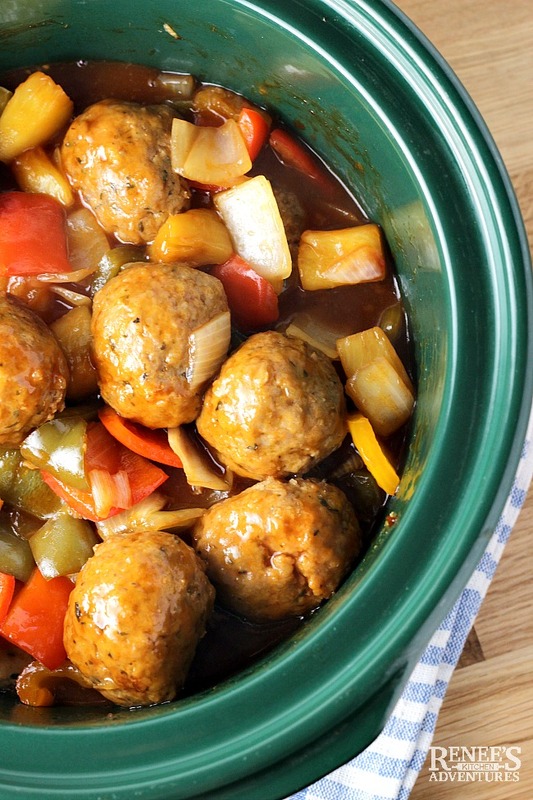 Pin Sweet and Sour Ground Pork Meatballs to your DINNER, Pork, or Slow Cooker boards! Oh Renee these look fabulous! Thank you Nora! My family devoured them! These would be perfect for any game day or the upcoming holidays. Everyone always loves to go for the meatballs and they are so easily portable!